Divorcee Hawick Lau To Restart Career in Hong Kong? Hawick Lau’s (劉愷威) appearance on an early January episode of CCTV’s I Want to Go On Gala Night <我要上春晚> was his first public appearance since announcing his divorce with Chinese actress Yang Mi (楊冪) in December 2018, and according to rumors, it could be his last appearance on Chinese television for a while. 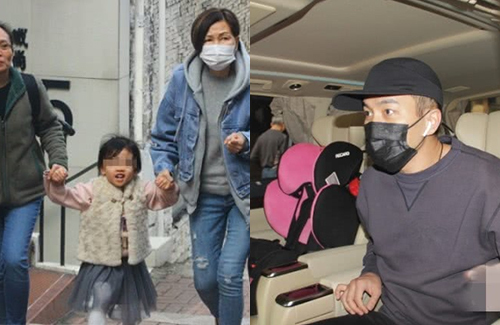 According to the Hong Kong media, Hawick has permanently moved back to Hong Kong to take care of his daughter Noemie, who lives with her grandparents. Hawick’s father, TVB actor Lau Dan (劉丹), even requested less screen time on the TVB sitcom Come Home Love: Lo and Behold <愛·回家之開心速遞> in order to spend more time with 5-year-old Noemie. Hong Kong reports are saying that Hawick is interested in leaving his Mainland Chinese career behind to restart his career in Hong Kong. Hawick’s rumors with Angel Wang (王鷗) had slightly damaged Hawick’s reputation, and with Yang Mi being one of China’s highest-earning actresses, Hawick’s career seems lackluster in comparison. Despite earlier rumors claiming that Yang Mi plans on fighting for full custody, reports are saying that Hawick and Yang Mi will raise Noemie together. Hawick and Yang Mi have also refused to share the reasons behind the divorce. Fortunately, it doesn’t appear that Noemie did not have to go through massive changes in her life after her parents divorce. Still living with her grandparents and father, Noemie continues to go to her playgroup every single day, and according Lau Dan, Noemie enjoys having fun. She often video chats with her mother, and their relationship has not changed. Ever since moving back to Hong Kong, the paparazzi has been keeping tabs on Hawick, but the 44-year-old actor appears to be living a rather mundane life. He is often seen shopping for furniture, daily necessities, or for his daughter. Recently, he was spotted loading large packages in the back of his mini-van. When paparazzi approached him to ask if a third party was involved in his divorce with Yang Mi, Hawick politely said goodbye. 4 comments to Divorcee Hawick Lau To Restart Career in Hong Kong? Not surprised. He was never that popular in Mainland China in comparison to his ex-wife and other “fresh meats”. And I don’t think he’ll be successful in restarting his career in Hong Kong either because he is a below average actor. @hazel Hawick has won awards for being best and outstanding actor in couple of dramas he has acted; he won even before meeting Yang Mi. Don’ judge and condemn he won’t be successful. He is good actor and has fans in many asian countries inc Thailand, etc. When he acted in Sealed with a Kiss, fans didn’t get enough of him and asked for sequel. Yang Mi is not a fantastic actress and only so so. I find her to be just average and cannot be compared with Gong Li, Zhang Ziyi.